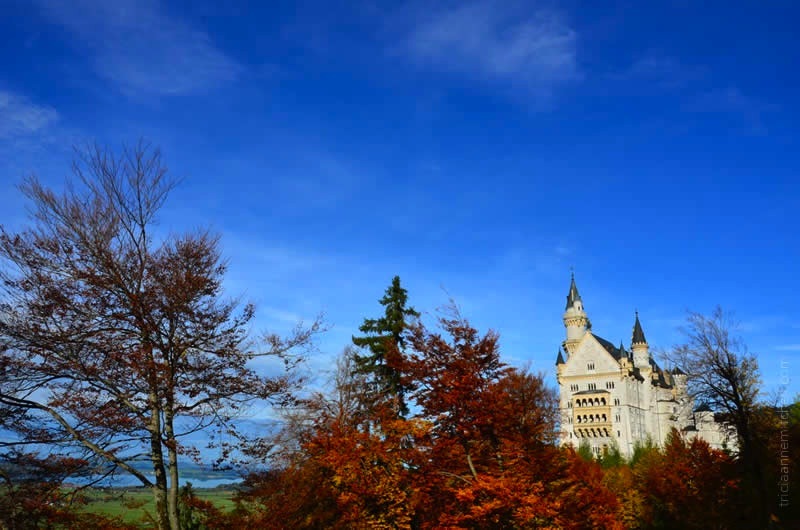 In German, the name Neuschwanstein literally translates to ‘new swan stone’ attesting to King Ludwig’s family’s heraldic-like connection with the graceful animal. When I was a little girl and visited the castle for the first time, however, I just couldn’t get the name to roll off my tongue in the right way. I mistakenly called it NeuSCHWEINstein (Schwein = pig), making the idyllic castle sound more like a pigsty than a regal place. Today, my parents and German friends don’t let me live that linguistic faux pas down. 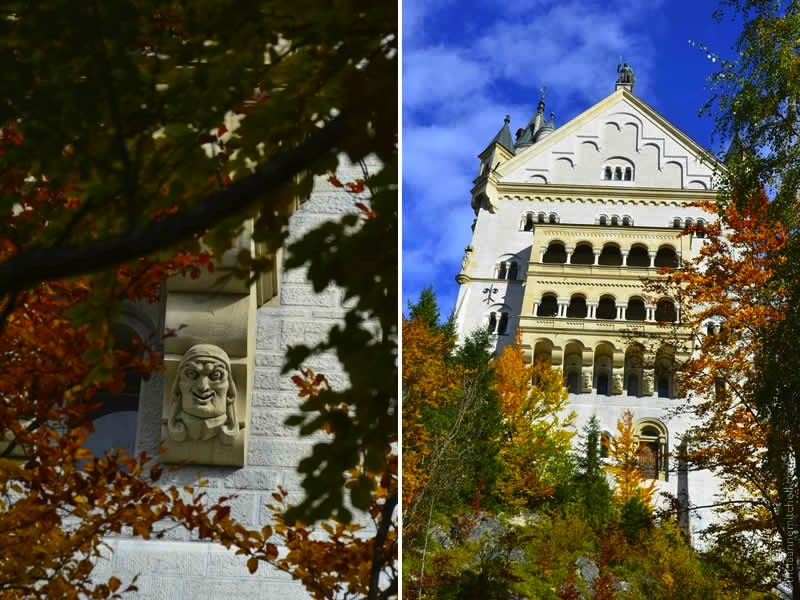 Wanting to create a private refuge where he could escape public life in Munich, King Ludwig decided to have the Romanesque Revival style castle built not far from one of his family’s nearby dwellings – the Hohenschwangau Castle. 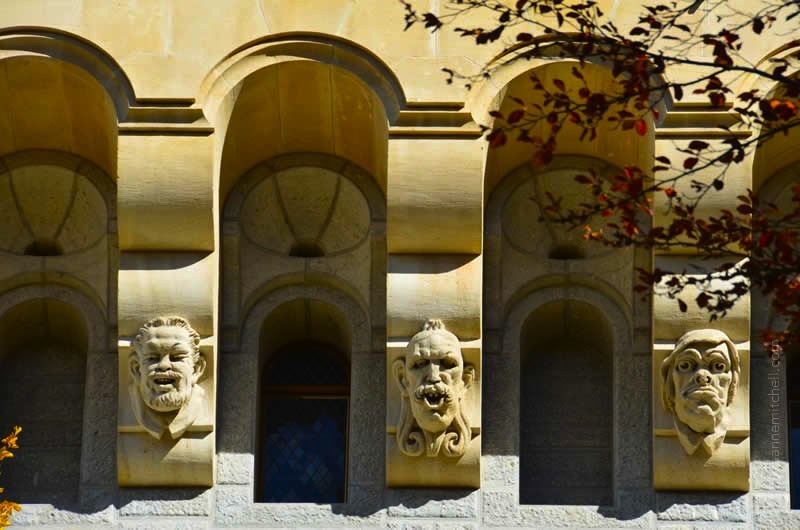 Obsessed with romantic ideals and the music of German composer Richard Wagner, King Ludwig incorporated various themes from Wagner’s operas into the castle’s design. In 1869, its construction began. Ruins from Middle Age-era castles had to be removed in order to prepare its foundation. After King Ludwig’s mysterious death in 1886 (which I detailed earlier in the year in this piece I wrote about King Ludwig’s smaller castle – Schloss Linderhof), the still-unfinished Neuschwanstein was opened to the public. Today, it’s perhaps best known as being Walt Disney’s inspiration for the so-called Sleeping Beauty Castle. 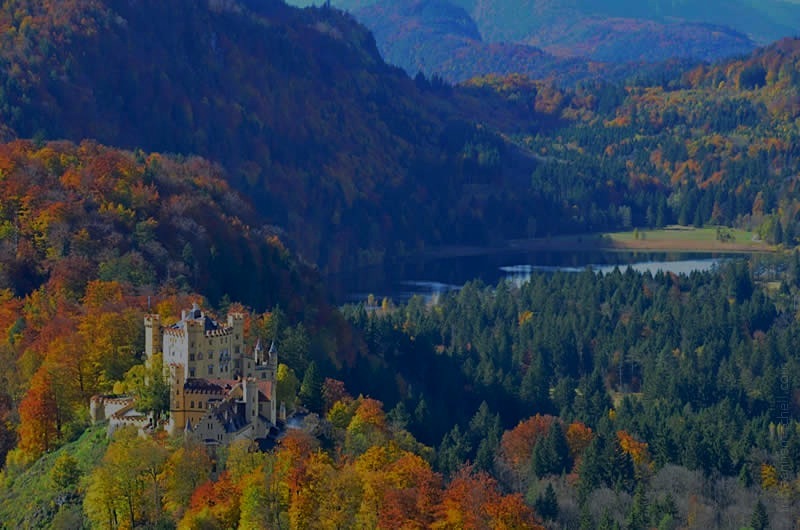 The nearby Hohenschwangau Castle – a boyhood home of King Ludwig. The requisite photo-snapping spot – Marienbrücke, an iron-suspension bridge over a deep canyon. 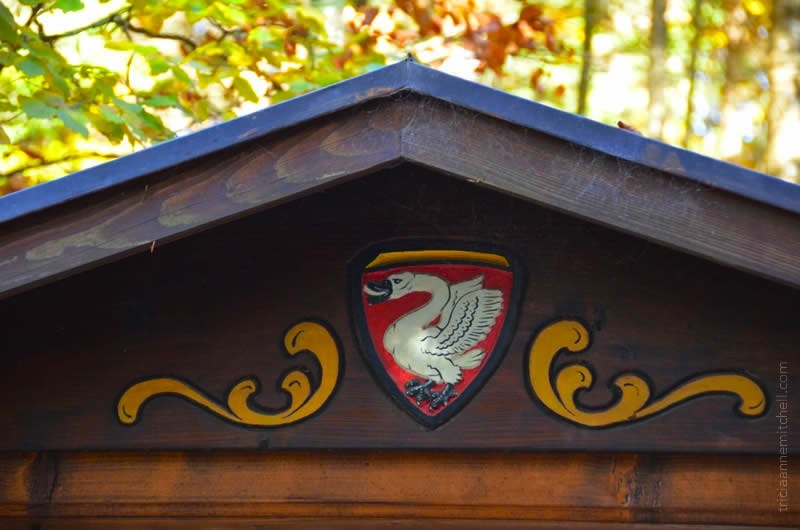 The swan theme played out on a wooden sign in the forest surrounding Neuschwanstein. 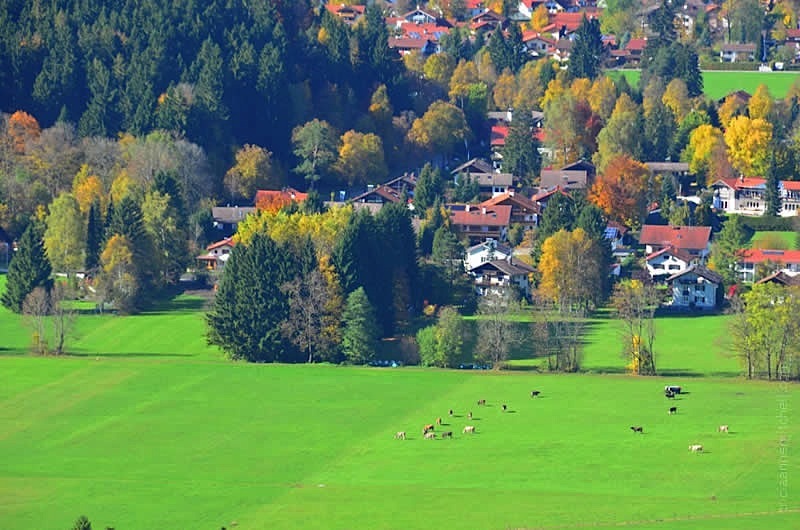 A paraglider with a bird’s eye view of the idyllic autumn landscape. 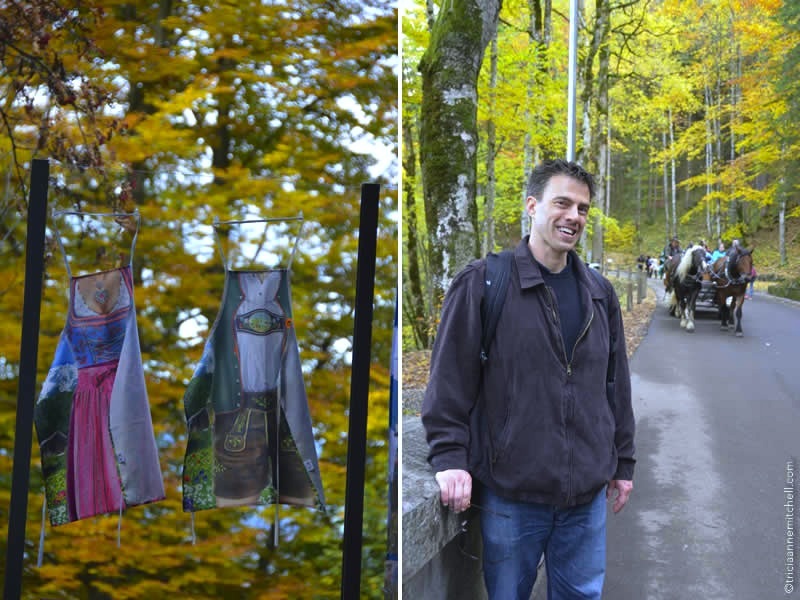 A pair of Bavarian-themed aprons, and Shawn posing near the horse-drawn carriages that ferry visitors between the village of Schwangau and Neuschwanstein Castle. 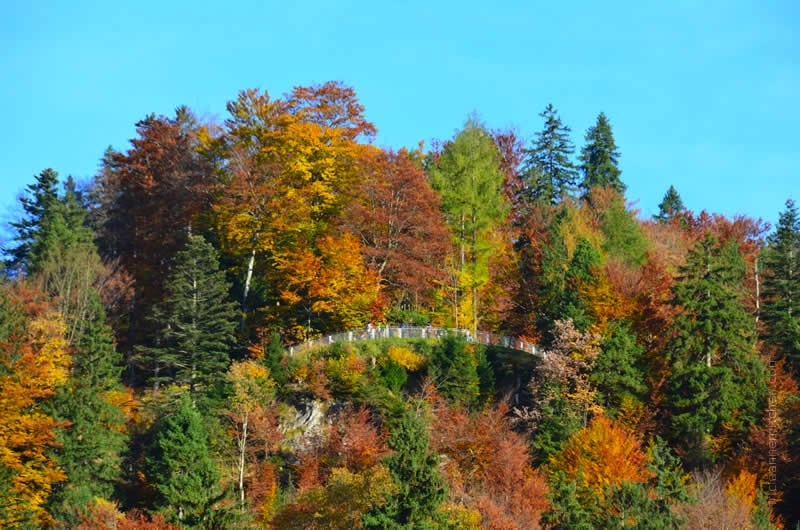 Nearby Hohenschwangau Castle on the left, framed by stunning autumn leaves. Neuschwanstein seemingly dwarfed by a nearby church with a traditional onion dome steeple. Opening times vary by season. 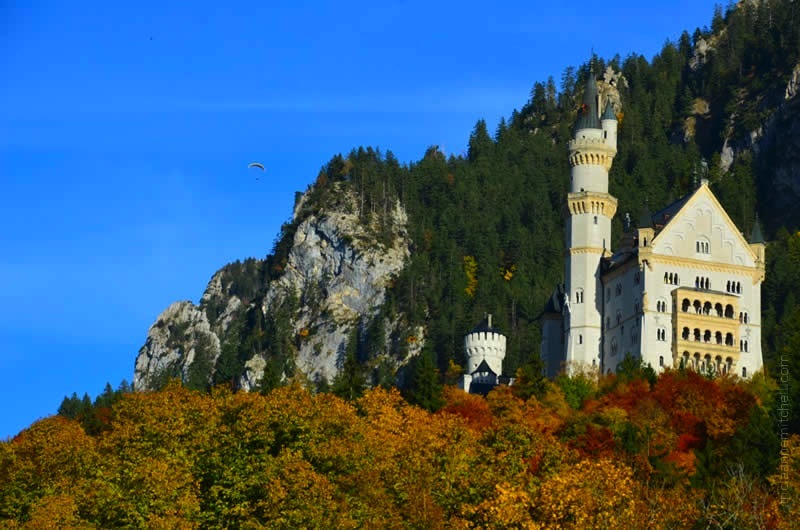 Be sure to check Neuschwanstein’s official site to confirm the hours and cost. If you’re visiting more than one of King Ludwig’s castles, consider the Königsschlösser combination ticket, which offers lower rates than if you purchased the tickets individually. 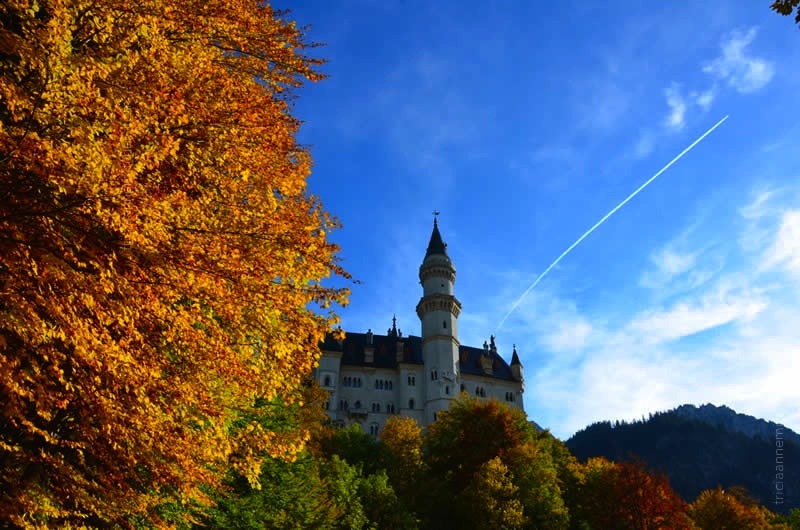 Several readers have contacted me to ask when the autumn leaves are at their best at Neuschwanstein. I took these photos on October 20th. 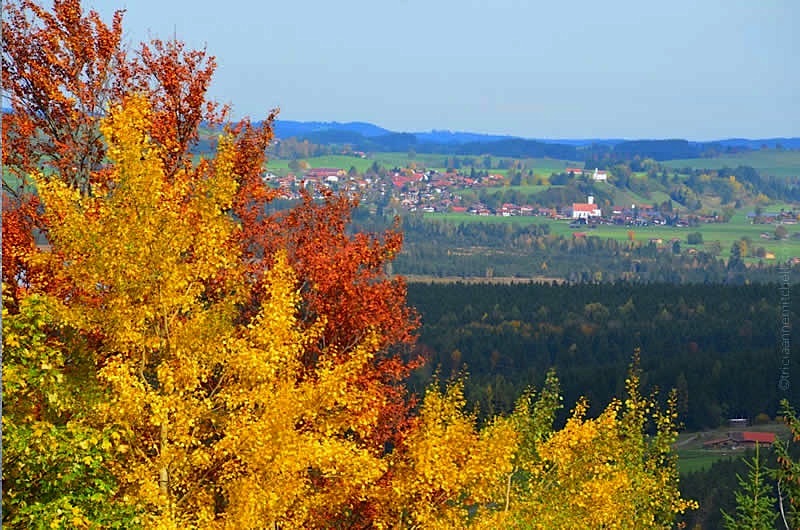 The fall colors peak at different times each year though, depending upon how cold the early-autumn period is in Bavaria. To make the trip independently via the German rail or by bus, consider getting the Bayern or Regio Ticket (website in German, but you can use Google Translate). These special tickets start at €20/25 for one passenger, and cost €6 for each additional passenger. You can use them to travel via bus and train throughout much of the region, making them a better deal if you want to make a few stops in a day. You can purchase tickets online, via a ticket machine, or in person. Interested in learning more about Bavaria’s beloved King Ludwig? Download the free app ‘Ludwig II – Walking in the Footsteps of a Fairytale King’ from the iTunes store. Are you looking for a guesthouse or hotel in Bavaria? Before my parents moved to fairy-tale Oberammergau, Shawn and I spent two nights at the Gästehaus Hildegard (affiliate link). We thought the beds were comfortable, the owners were helpful and kind, and the breakfast was tasty. The guest house is centrally located in the town too, and it’s not far from the Tiroler Gasse bus stop. The train station is also only about 1 km away. 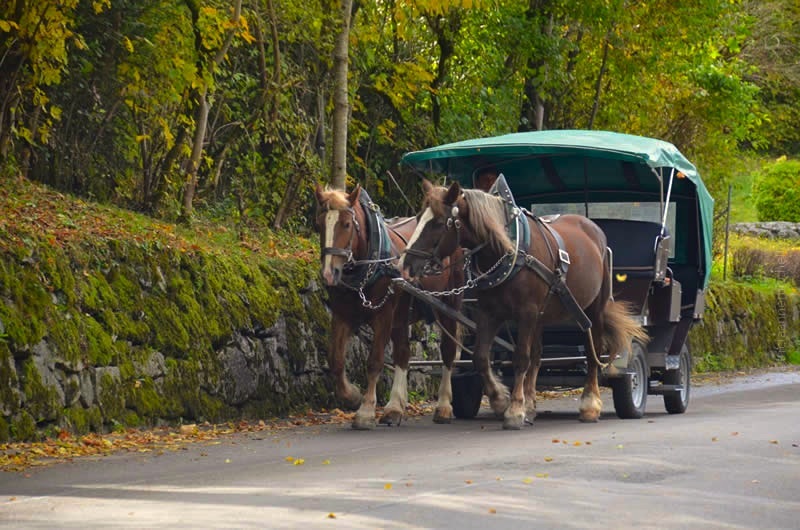 Oberammergau and Neuschwanstein Castle are about 1.5 hours by car/bus. Need more inspiration? This link contains an index of all my posts from Germany. Photography & text Tricia A. Mitchell. All Rights Reserved. That’s a beautiful castle. Thank you for sharing your beautiful pictures. Jo, we were also dazzled by the splendid colors! I recall the “ethereal bridge” that you mentioned as feeling very solid – a different case than the Marienbrücke suspension bridge that Shawn and I tiptoed out upon for our picture together. Though I’m sure the wooden beams of the Marienbrücke were quite strong, the shifting made me nervous and ready to finish our Kodak moment quite swiftly. 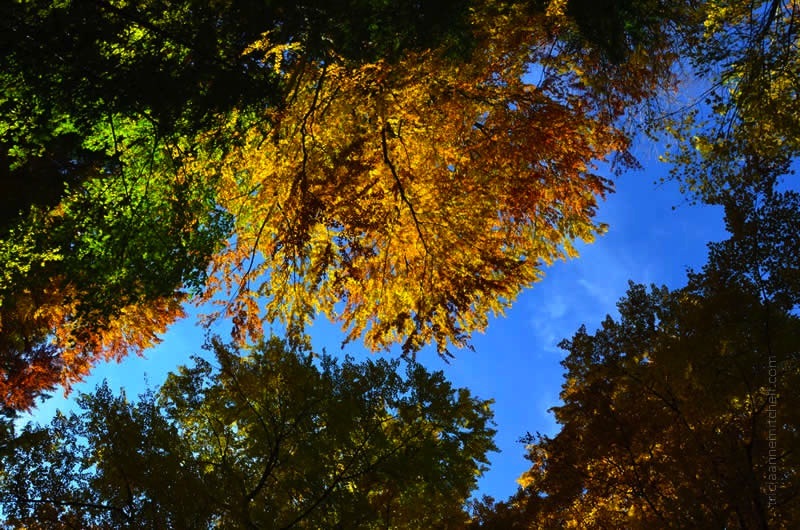 :) Do you have many colorful leaves on your trees there? 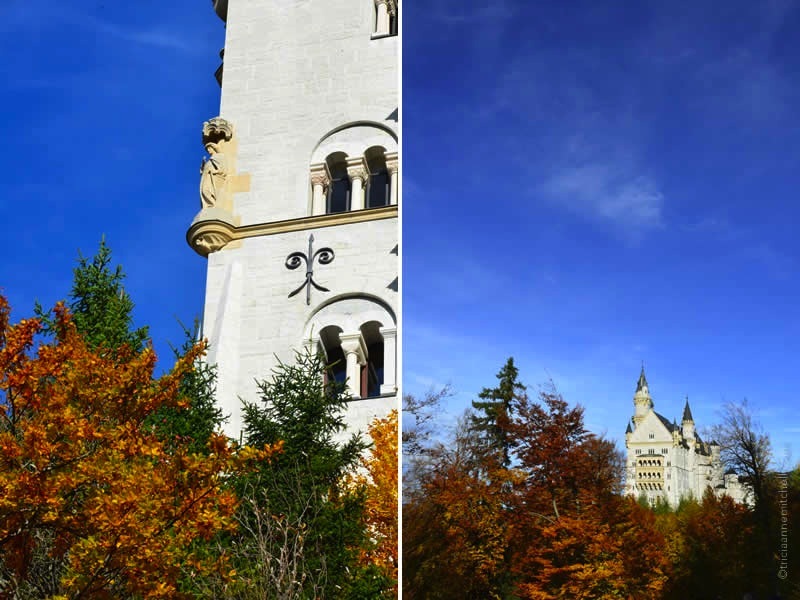 Just in the past few days since we visited Neuschwanstein, the trees have shed most of their fall colors. We had a pretty lovely day here today, Jo, but a bit of hail, wind and rain rolled in this evening. I’m glad we enjoyed autumn via bike rides and walks when we did. Stunning pictures as always Trish. How much longer are you staying in Germany? 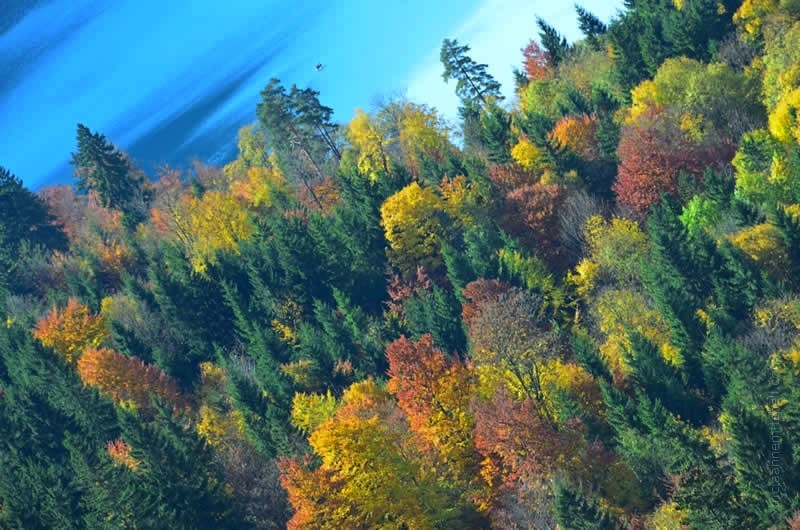 Gorgeous pictures – the brilliant autumn colors add to the magic! I like your funny linguistic story! That’s kind of you to say, Marilyn – thank you! 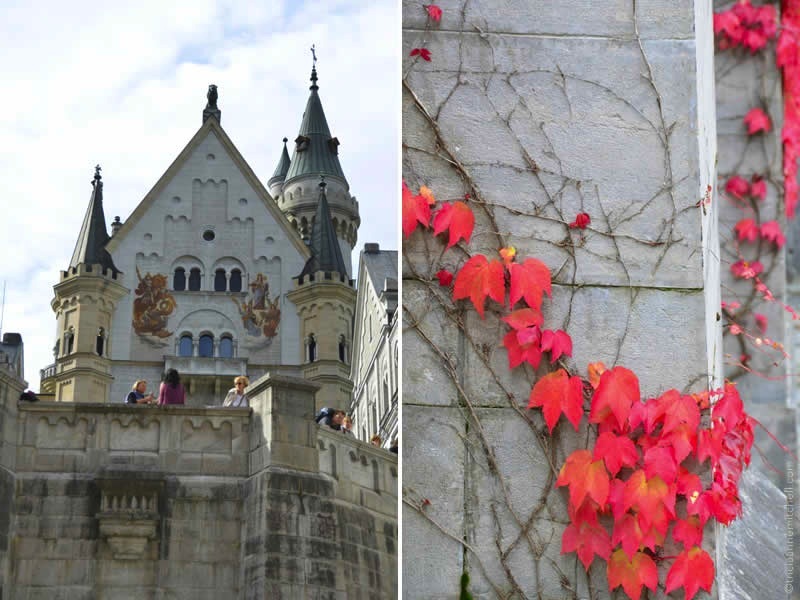 Since my husband had never been to Neuschwanstein Castle (despite having lived in Germany for over a year) we tried to time our visit with nature’s autumn palette. So glad we did, for the colorful leaves framed the castle so memorably. Just curious, when did you visit the castle? I wanted to visit when the trees are also a pretty fall color :) Absolutely love the pictures! Hi Danielle, thanks for your thoughtful words. I just peeked at our digital albums and saw that we were at Neuschwanstein on 21 October. My parents live in the mountains in Bavaria, and leaf-turning times can vary based upon how cool or warm the first few weeks of autumn are. 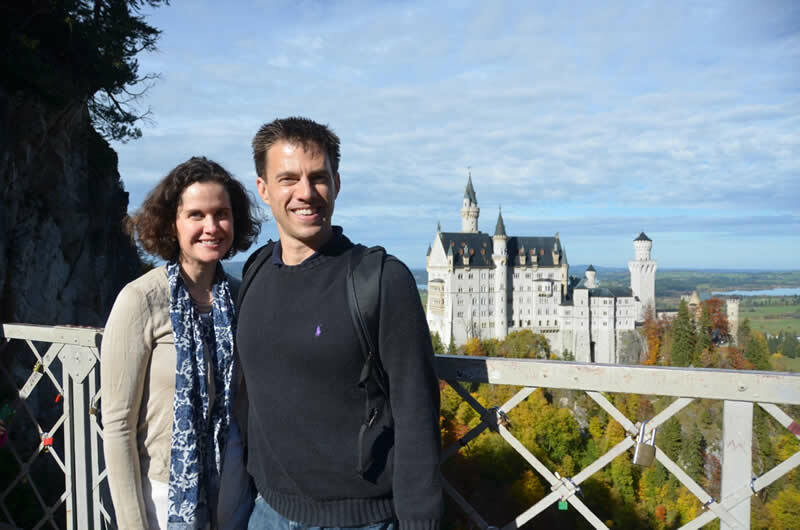 We were lucky in that we were able to visit Neuschwanstein with a flexible schedule. 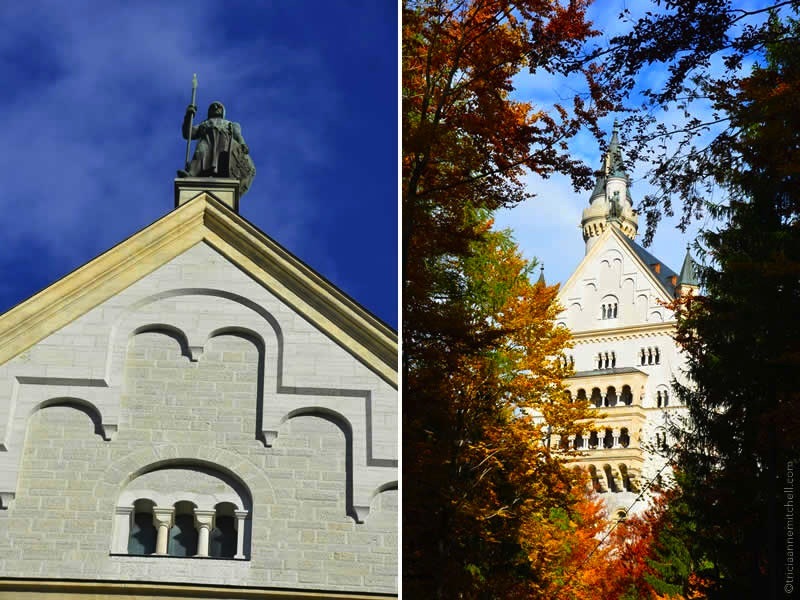 We noticed that the leaves in my parents’ village had just about peaked, and so we hopped on a bus to Neuschwanstein shortly afterwards. :) To be sure, I wonder if you’d have any luck contacting the tourist offices listed on the Neuschwanstein website? http://www.neuschwanstein.de/englisch/tourist/links.htm Hope it works out for you! 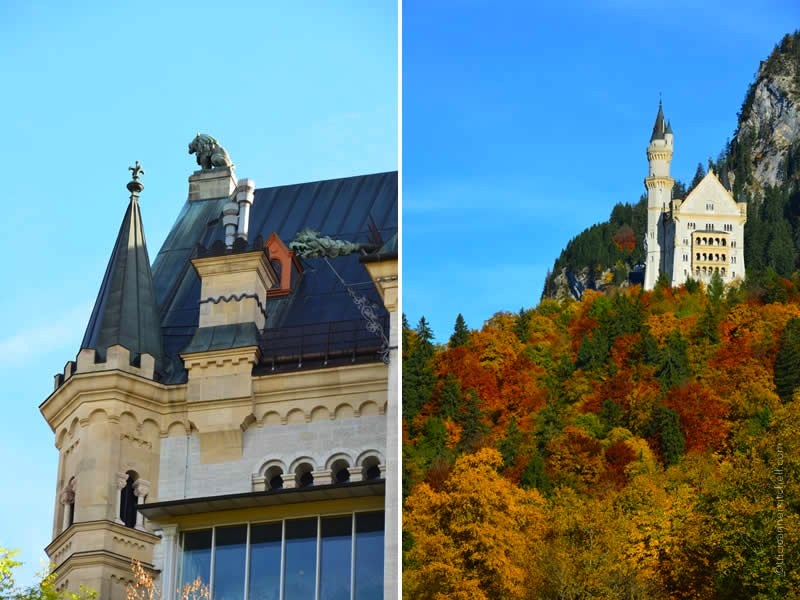 Either way, I’m sure you’ll love Neuschwanstein. Thank you for all the information :) I am actually living in Nurnberg, Germany right now and have already seen Neuschwanstein last April, but my boyfriend (who is German) has never seen the castle before, and we only live a couple hours away. But when I was visiting the castle, I bought a postcard that I absolutely love looking at. It looks exactly like the pictures that you took with the all of the trees colored. We wanted to go there October 1, but I am afraid that we will be a little too early for the leaves to turn. That’s why I was asking which date it was exactly. But since I am in the area I think I can just look out the window and get a good idea as to how the trees will look. You’re very welcome, Danielle. How fun that you’ll be able to compare it over the course of a few seasons. Someday, I’d like to see the castle dressed in snow, but that would make for a chilly visit. :) Enjoy! Neuschwanstein Castle is so dear to my heart. My son painted a picture of it for me last Christmas and it hangs above my mantle, so I look at this castle every day. so beautiful! It’s exactly like I imagined a fairytale castle – I wonder if that’s the Disney influence. Spectacular pictures, I was there in summer but it looks so much better with all those colours! Davide, many thanks for your kind comment. I haven’t been to Neuschwanstein during the summer months but I bet it was still pretty impressive surrounded by a sea of green trees. 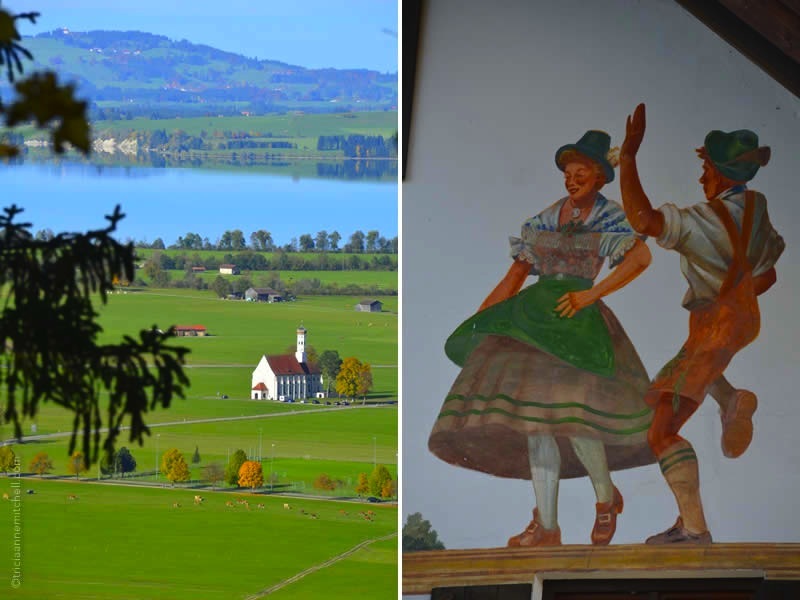 Did you visit other spots in Bavaria? Still a lot of magic in these old castles! And what beautiful fall colors, just gorgeous. Annette, I’m guessing you got to see a lot of these spots growing up? Do you have any favorite castles? I’ve especially enjoyed Burg Eltz, Linderhof, and the Heidelberg Castle – where we were married in 2010. So true, Tricia. I loved the Heidelberg Castle and always enjoyed hiking up to the many local remnants of castles and forts dating back to the Middle Ages. There are so many of them all over the Black Forest. Where I grew up, in Neuweier, there is the Yburg and, down in the village, a newer castle (still hundreds of years old) and I found out from a local historian that there was an underground tunnel built from the castle below all the way up to the top of the mountain where the fortress is located (a few kilometers length). One can only imagine the uses of such a tunnel during times of invasion, burning and slashing…. I’ve really enjoyed my times in the Black Forest and hope to get back there – and to Heidelberg – next summer. Growing up in Neuweier, did you make it to Alsace often? One of my favorite Saturday pilgrimages used to be to that part of France, where I’d visit Strasbourg, or villages on the route du vin, filling my wicker basket with wine, cheese and other treats to sample. Absolutely amazing views! Well done. Hi Phil & many thanks! This is definitely a setting I’d like to experience in all four seasons, though I suspect fall and winter are the most atmospheric. Ein netter schöner Besuch! 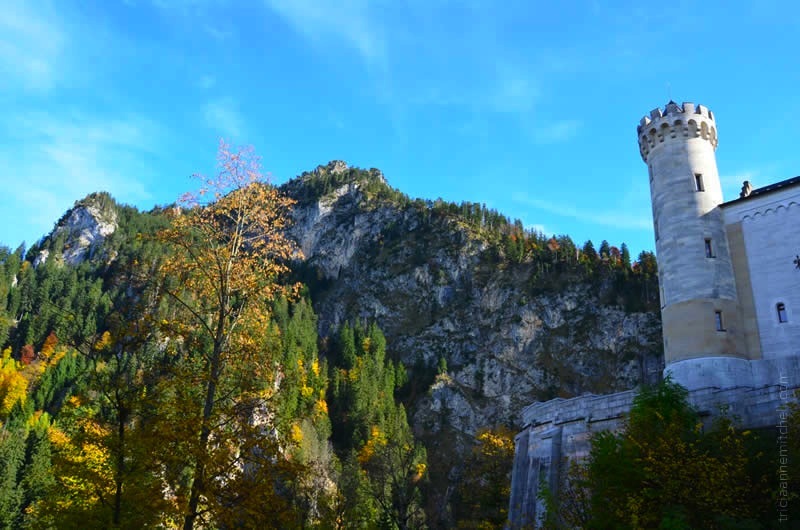 :) A lot of folks don’t like coming to Schwangau because of the regimented entry, the fact that one can’t wander through the castles by themselves, and oh yes, the crowds. But there’s something to be said about the historical significance of these castles to the “nation-state” of Bayern, and the immediate surroundings. That you visited during a very decent autumn day is an excellent bonus with all those colours on the countryside. Great stuff, Tricia! Henry, I haven’t been to Neuschwanstein during the peak summer months, but I can imagine how hectic Schwangau must be then. We were indeed lucky to have such glorious weather during our autumn visit. Dare I confess that we didn’t go inside, as we didn’t want to go on a guided tour. We enjoyed picnicking in the forest, and enjoying a coffee at a café below instead, taking things at our own pace. Since my parents live nearby, I know we’ll be back someday so that my husband can see the inside. Schloss Linderhof is a castle interior that I’d love to see though. Have you been there? The Grotto and Moorish Kiosk look intriguing, and the gardens are very impressive. Henry, here’s hoping you’ll get a chance to explore that swathe of Bavarian land sometime soon. 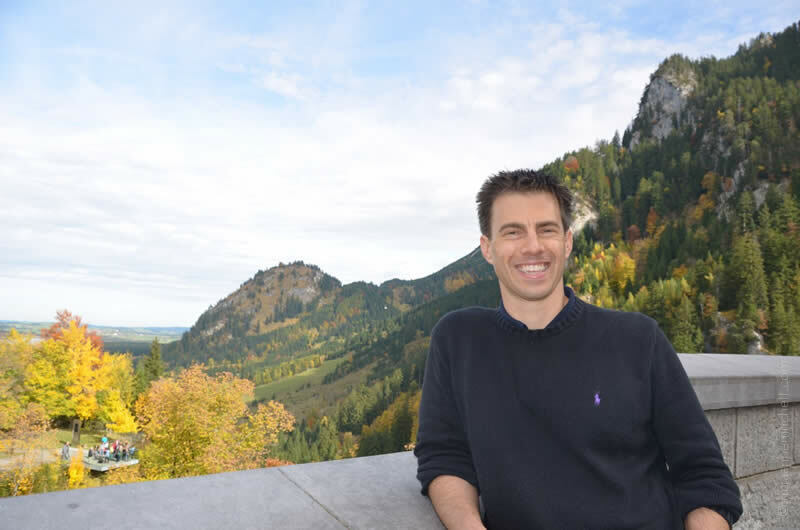 If you’re ever in the Oberammergau area at the same time as us, Shawn and I would be happy to connect with you! Hi, Tricia. Das möcht’ ich gerne! 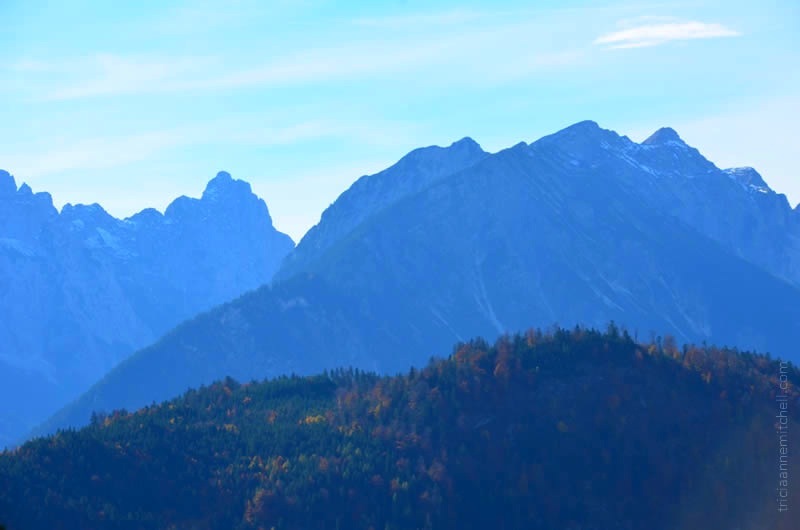 :) With my long-standing view of Germany not only as “home” but also as “life project”, I would love to spend a lot of time in the Bavarian Alps, and speaking with people (and getting a hang of *that* accent!) to find out what their lives are like. Oberammergau and “The Passion Play” would be fantastic. The idea surrounding the town’s epic undertaking for the decadal play is wholly fascinating, oder? Thanks for your offer; it’d be great to see that area with you, too! Henry, I’d love to see the play in Oberammergau someday too – guess we’ll all have to wait another 6 years. :) Living in the village, my mom will periodically bump into the various characters; a month or so ago, she kept bumping into ‘Jesus’ out and about in the community. We heard that many of the male residents grow out their hair and beards during the Passion Play months. What stunning photographs. It looks like fall is a great time to visit this special place. I loved your story about the mispronounciation, very funny. Families don’t seem to foget those things either do they. Darlene, I greatly appreciate your compliment, though I must credit Mother Nature for the photogenic scenery. :) Speaking of funny childhood mistakes and being reminded of them in adulthood, when I was a child, I also fell for our German friend’s comment about Alpine cows having longer back legs (which supposedly allowed them to maneuver the hillsides). So gullible. Tricia, you did it again, capturing the castles in the most beautiful perspective. Looks like you had an absolutely gorgeous and perfect day of fall, the colors of the leaves and trees are so intriguing. You are becoming an amazing photographer!!! Cornelia, we were lucky to have timed our visit to Neuschwanstein just as the leaves were reaching their peak (last Monday). Shawn had never been there before, and so we thought autumn would be a great time to go. 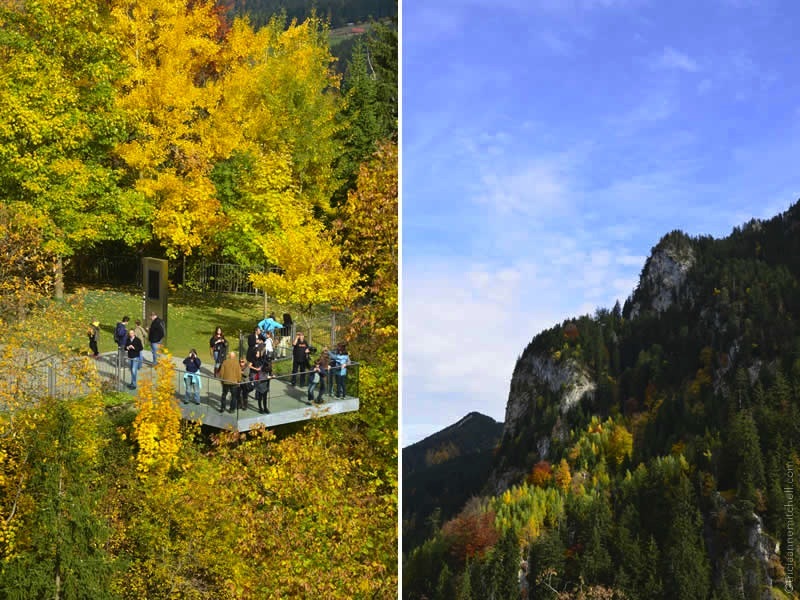 It’s nice that this is only about an hour from Oberammergau – making it an ideal day trip destination. 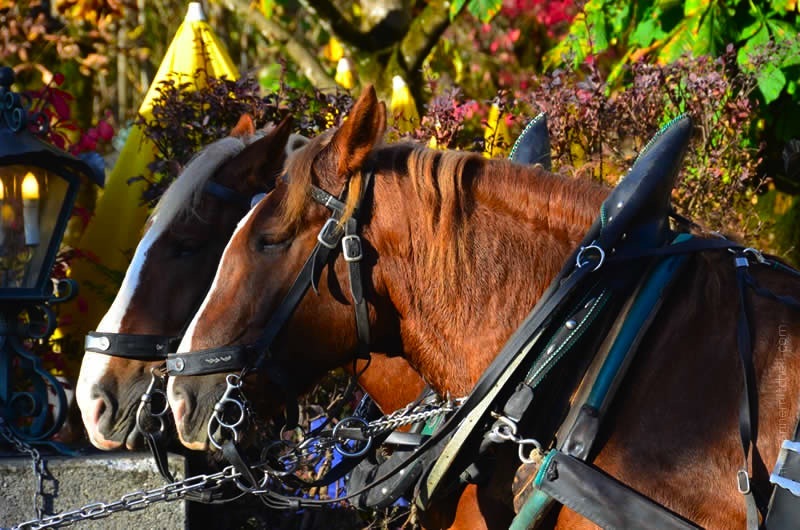 We rode the Oberbayern bus and just enjoyed the ride. A lovely, carefree day. I think this has to be my favorite time of year to be in Bavaria. We were there in October two years ago and it was just as beautiful. One of those timeless scenes! 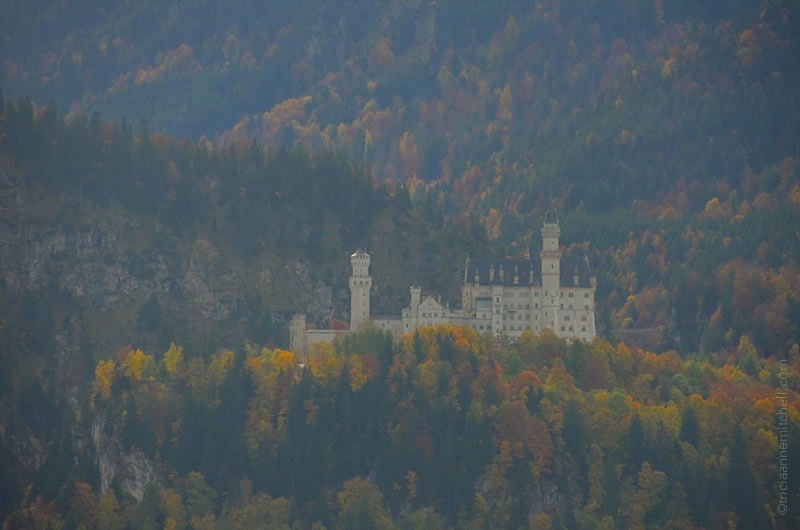 Jamie, I’m glad you also got to take in Neuschwanstein’s autumn splendor. Speaking of timeless scenes, I also greatly enjoyed seeing some sepia / black and white vintage imagery of Neuschwanstein (of its construction, as well as in the in the early 20th century). It’s wonderful that the Bavarian Palace Dep’t has done such a seemingly effective job of keeping the castle’s surroundings intact. Thank you for taking us on the ‘grand tour’…..we will have to put this on our to do list! My pleasure, David. Do you have plans to head to Germany sometime soon? By far the best time of year to be out among ancient forests – lovely tones and light! Agreed, Alessandro. 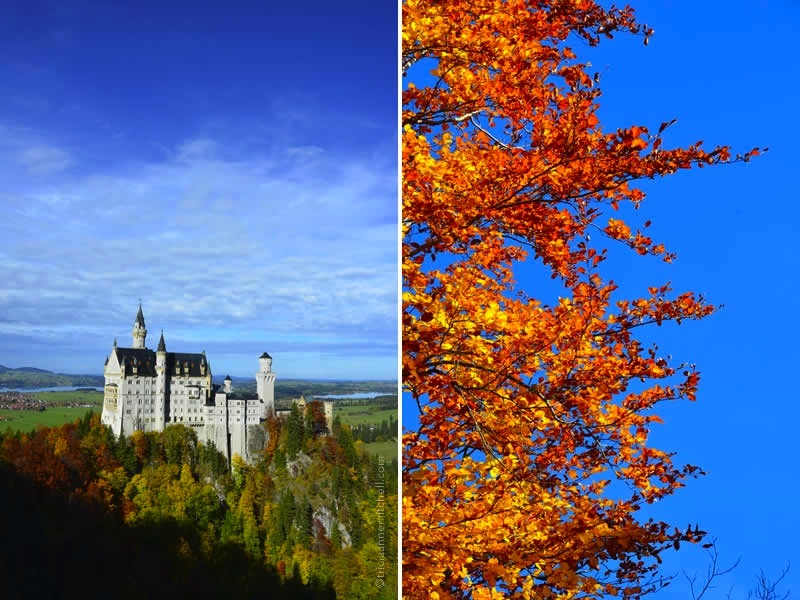 Knowing of Germany’s penchant for grey winters, we snapped up the chance to celebrate Neuschwanstein donning her autumn hues under clear skies. As always – grazie! Great pictures. Have you been to Herrenchiemsee yet? We went there two weeks ago, was really nice. Although Linderhof is still my favourite! I haven’t been to Herrenchiemsee, but would love to do so next summer! Did you get inside Linderhof? We made it there late in the afternoon, so had missed the tour times, but the grotto and Moorish Kiosk sound fun. I enjoyed your post about Ludwig’s palatial trio by the way. Thanks for sharing it, Laura! Thank you and thanks for sharing your experiences too. Yes a patient man helps. I think mine is kind of relieved to have done them all now although I think he really enjoyed them too :) You will love Herrenchiemsee and don’t forget the hide-away in Garmisch! Many thanks, Jenn. I imagine autumn in your part of the world has been pretty stunning too? It was lovely Tricia, but really all too brief! Sounds a bit like ours too – an unexpected snowfall, a few days to enjoy the stunning colors, and then the trees shed their beautiful foliage. I’m grateful for a beautiful few days though and hope to see the area dressed in snow at least one more time. 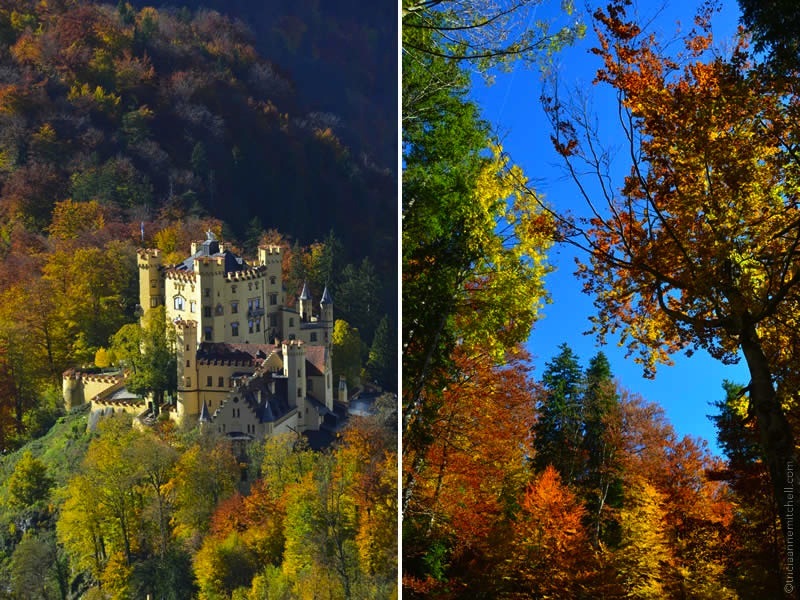 Fairytale castle in lovely situation with a backdrop of stunning autumn colours. King Ludwig II certainly had a knack for choosing the most dramatic settings for his castles, didn’t he? The nearby Linderhof Castle has an equally-gorgeous mountain setting. We headed out there by bike a week and a half ago. The foliage was still quite lovely, but the Bavarian castle association had already crated up the fountains to protect them from the harsh winter weather. 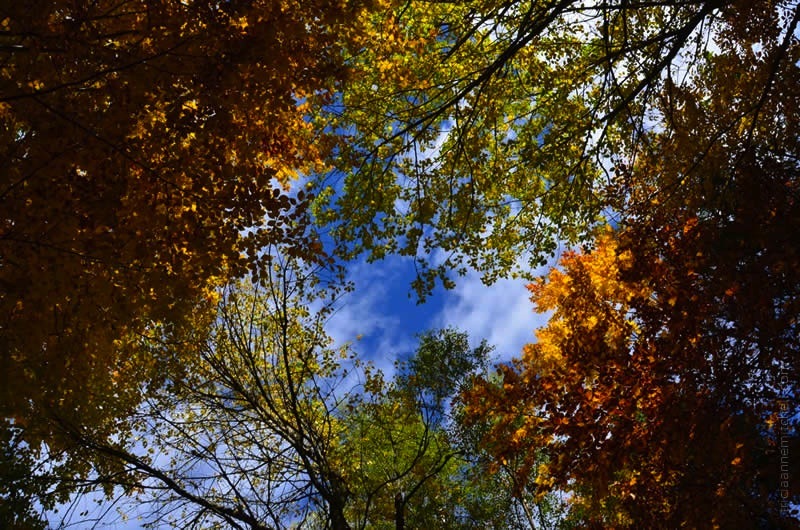 Hope you’ve been having a beautiful fall, Dorothy! 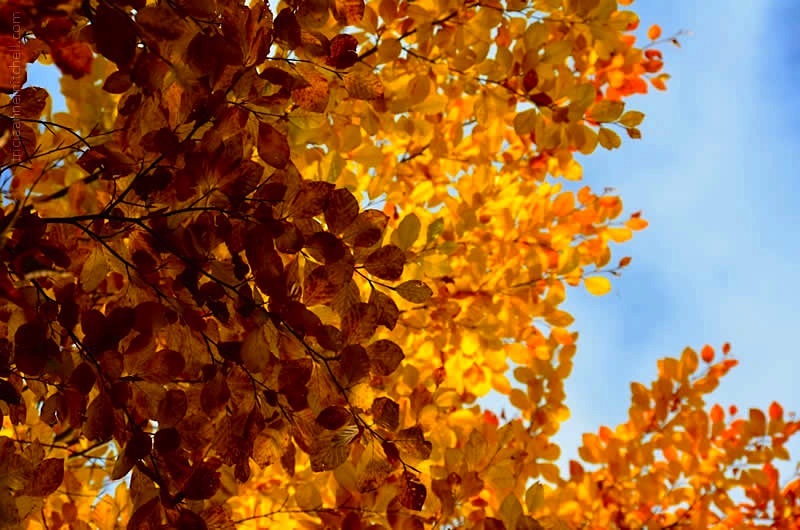 The fall colors are beautiful, Tricia! Oh, how I would love to see this, especially surrounded in such splendid colors. I feel like I stepped back in time. The bridge through the trees is something. Great snapshots of you both. Lynne, the only season which I think could rival autumn’s level of beauty at Neuschwanstein is winter. When I was in 2nd grade, we did make a March pilgrimage to the castle, but I don’t remember the branches and turrets being dressed in snow. (Instead, I just remember slipping and sliding on the long footpath leading to the castle.) Are you still road-tripping? Yes, today is our last day in Louisiana and then we’ll head home…taking three more days. It has been most enjoyable. Glad to hear your adventures have been refreshing and fun. I look forward to reading your adventures once you have time to unwind back home, Lynne! Heavy sigh. Love this place more than almost anywhere else in the world. Gorgeous photos, Tricia! Amazing scenery and architecture … though I prefer Ludwig’s childhood home to his fantasy castle! Wonderful photos…what a treat for us all.. Funny that you should mention that, Valerie. Though Neuschwanstein’s scenery is utterly dramatic, I would be more than happy to have lived in the more ‘petite’ Linderhof Castle. Thanks for letting me know that you enjoyed the set of images – that means a lot! 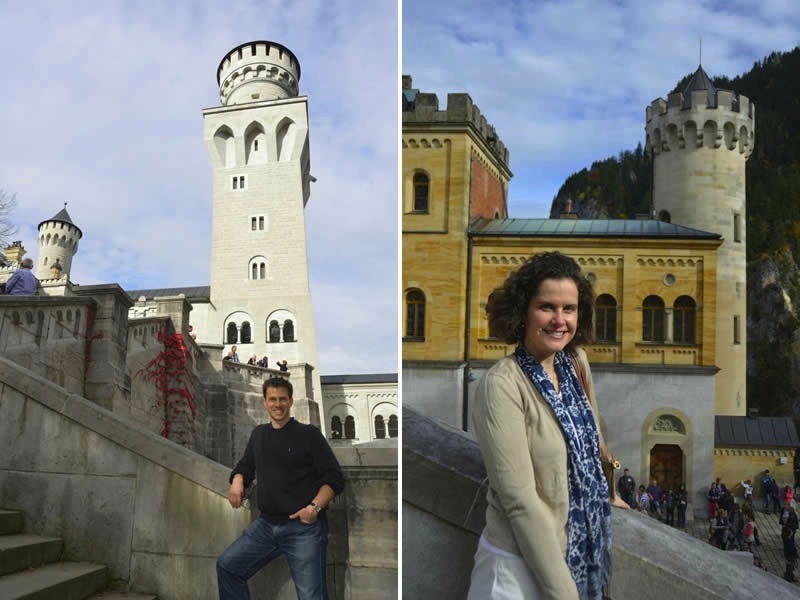 Megan, yes, the smaller castle (Hohenschwangau) was one of King Ludwig’s childhood homes. I haven’t been inside it, but love its position near the two lakes. What a brilliant post. This must have taken you ages to put together! So much information and so many gorgeous images. I especially love the ones where you look down on the castle from a distance. Wow. Belated thanks, Rachael. The time passes quickly when you’re doing something you enjoy. :) Here’s hoping you’ve been having a splendid weekend! I’ve been there twice, but never in the Autumn… what gorgeous colours! I couldn’t keep from marveling at them for the entire afternoon. :) On a side note, it looks as though we’re returning to Croatia for at least part of the winter. As much as we’d love to return to Trogir, we’re thinking it would be fun to have a new adventure and not try to top the fantastic time we had last year. So, it seems we’ll likely be coming to Split sometime next month! another Adventure in Croatia (Split….) I am you’ll have a great time! This was one of my favourite places in Germany. 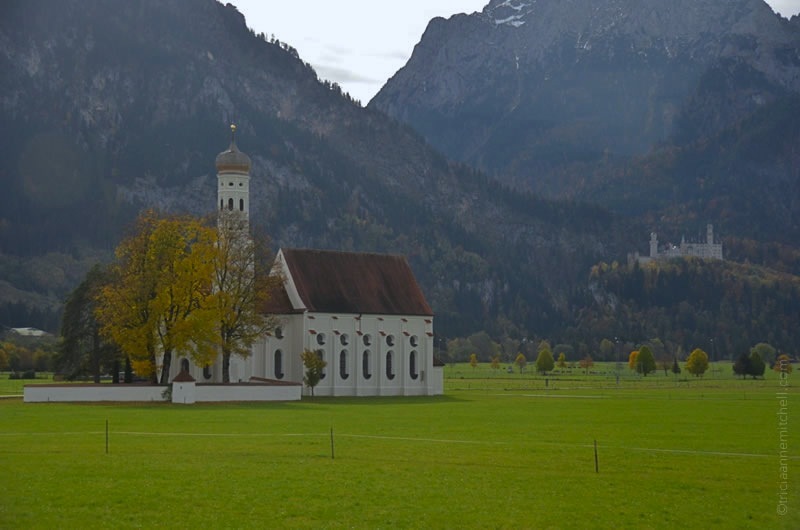 We took the bus from Garmisch and it was a wonderful drive, and great value too. I felt sorry for Ludwig, his life sounded so unhappy. Carol, I must confess that Bavaria is also one of my favorite parts of Germany. (Baden-Württemberg also holds a special place since I lived there, in Heidelberg, for 10 years.) Regarding King Ludwig, I read that a German novelist recently penned a Da Vinci Code-esque thriller about his life. I’m wondering if it has many authentic historical tidbits woven in, which I think could make for a very interesting tale. Sylvia, we lucked out with our timing to visit Neuschwanstein, as the foliage was just perfect! The castle’s dramatic setting is really what sets it apart from other famous castles. Thanks for dropping by, and hope you have a wonderful weekend. Are you in FL or South Africa at the moment?